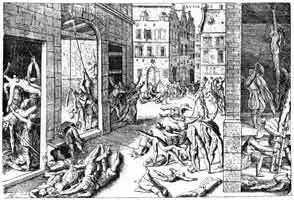 Torturing of jews accused by the inquisition as heretics and perpetrators of black magic. Another scene of torturing Jews. 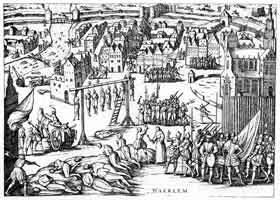 Protestants and jews accused by the inquisition heresy and witchcraft. From a contemporary woodcut. Nuremberg, 1493. Hanging of a farm woman declared by the inquisition to be possessed by demons. 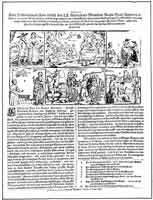 From Rappresentatione della passione. Florence, 1520. Two dominican monks burned at the stake by order of the inquisition for allegedly signing pacts with the devil. From the Histoire Véritable de Quatre lacopins. Geneva ,1549. 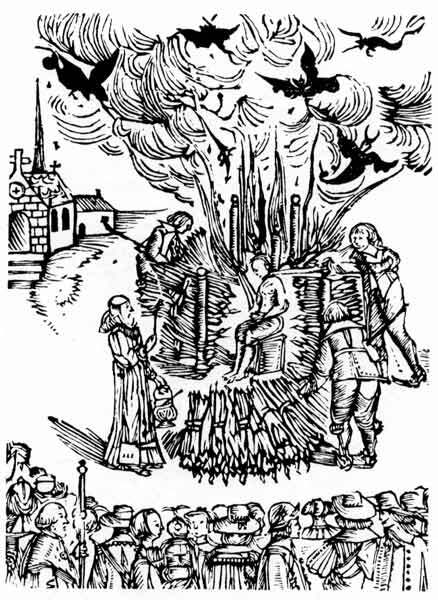 Broadside newsletter about the public burning of three witches Derneburg October 1555. Newsletter about the infernal deeds and the execution of the witch Anna Eberlehrin. Printed by Elias Wellhöffe, "Briefmaler" at Ausburg, 1669. Mass execution of citizens of Haalem as disciples of the devil under Fernando Alvarez de Toledo, Duke of Alba, after the conquest of Haalem in 1753. The torture of the inhabitants of Antwerp by Spanish troops under Fernando Alvarez de Toledo, Duke of Alba, after the conquest of the city in 1756. From Michael Aitsinger's De leone Belgico. The public burning of Farther Urban Grandier for signing a pact with the devil. From a contemporary drawing. Loudun, 1634. 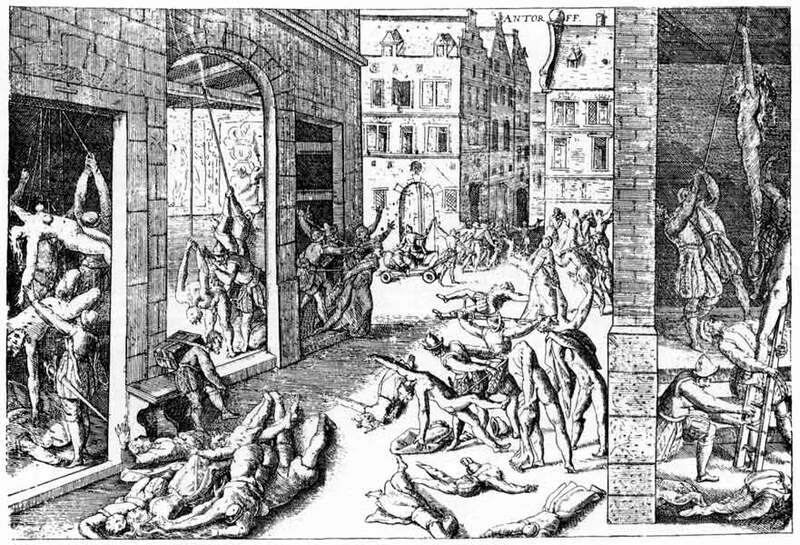 Public hanging of witches. From Sir George Macenzie's Law and Customs in Scotland in Matters Criminal. Edinburgh, 1678. Title page from one of Cotton Mather's witch-hunting pamphlets. Printed by Benjamin Harris for Samuel Phillips. Boston, 1693. Title page from from another edition of Cotton Mather's witch-hunt pamphlet, re-printed from the Boston edition for John Dutton. London, 1693.